I am a friendly girl and always eager to get close to anyone who offers me pets and kisses. Various people like mailmen, landscapers and builders we meet along our walking route are all my potential friends. Strangers often comment on my magnificent good looks and geniality. The dog park is also the perfect place to greet new canine pals. At home my favorite playtime activity is pulling my stuffies out of the toy box, shaking them around a bit and then looking for my next “victim”. My version of fetch is to push a tennis ball with my foot and then pounce on it. I quickly catch onto basic obedience commands like “sit”, “come” and “down” to name a few and look forward to treat rewards of cheese and little doggie biscuits. Mention the word cuddle and I will be there next to my humans with my paws over their legs waiting to get hugs and ear scratches. I am a typical charming, well-mannered and intelligent Golden Retriever. I am also visually impaired. I have been diagnosed with Golden Retriever Pigmentary Uveitis and am currently blind in my right eye. GRPU is a bilateral progressive disease which causes an inflammation of the middle layers of the eye. The vision in my left eye is limited and with time, I will be totally blind. 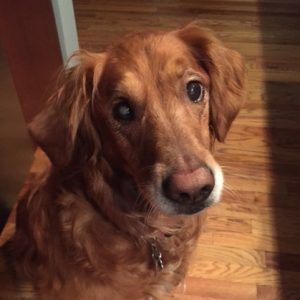 My canine ophthalmologist assures me that blind dogs can learn to navigate very well using their keen senses of smell and hearing and my lack of sight won’t affect my sweet gentle demeanor or my ability to live an active Golden life. The doctor shared that there is a plethora of information available in books and on-line about living with dogs whose sight is debilitated. I was happy to hear that there is also a large variety of sound making and odor and treat emitting toys available for the enjoyment of pups like me. I am looking forward to checking them out! Foster mom puts drops in my eyes every day and I will need to visit my eye doctor periodically throughout my life. I also take two little pills a day to keep my thyroid running smoothly. I am searching for a forever family who will be willing to patiently teach me to recognize and maneuver around objects I cannot see and keep me safe. I love most other dogs and would like to share a home with a calm and confident canine sibling who would be my companion, guide and snuggle buddy. A fenced yard would be perfect so that I have a reminder of where my outdoor boundary limits are. But, in reality, the only special need I have is to be loved and accepted just the way I am.